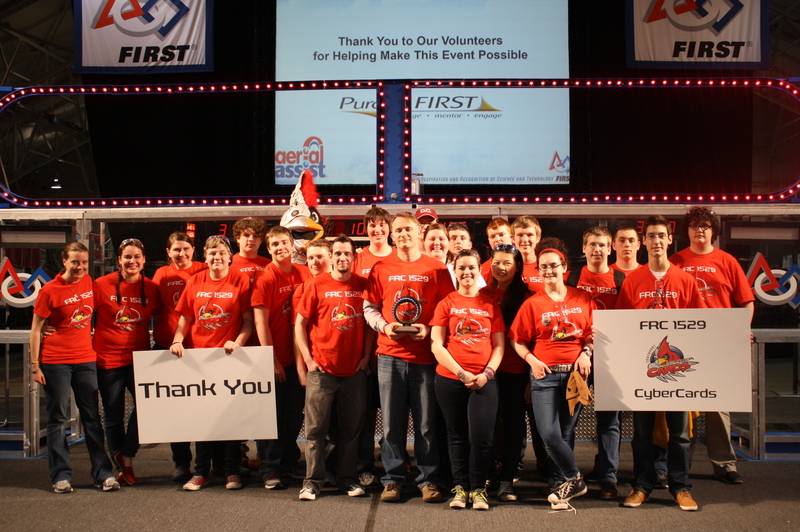 FRC 1529 had an amazing time at the 2014 Boilermaker Regional this past season. The team faced some challenges, but our students were engaged and excited throughout the entire event! 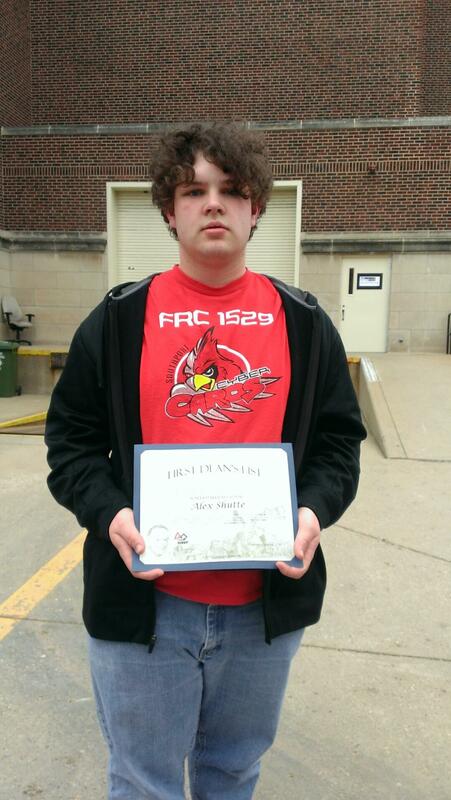 One of our seniors, Alex Schutte, a student on FRC 1529, received the FIRST Dean’s List Finalist Award. 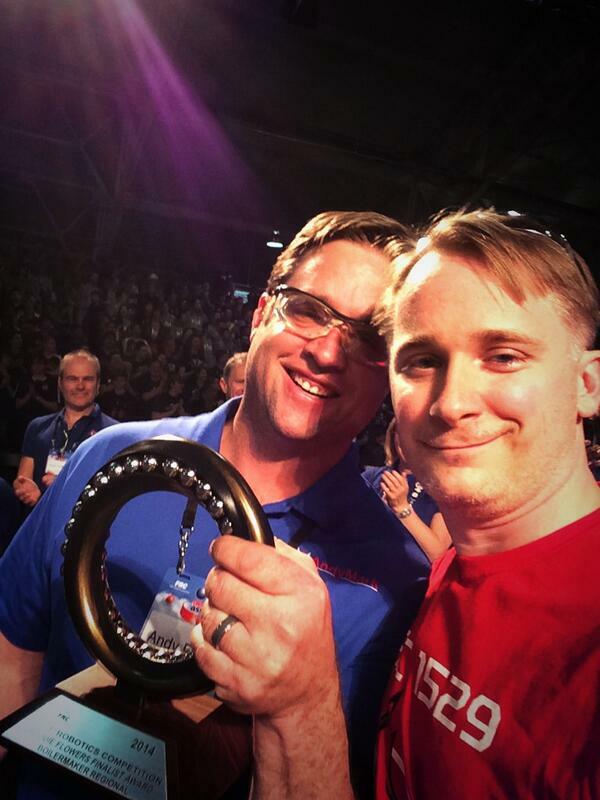 The team’s lead mentor Mike Taylor, a Southport High School PLTW Teacher, was given the Woodie Flowers Award. Mike Taylor receiving his WFFA from 2003 Championship Woodie Flowers Award Winner Andy Baker of AndyMark, Inc. Both awards show the dedication and passion these individuals have for FRC 1529 and the team couldn’t be prouder of their achievements! The FIRST Dean’s List Finalist Award was created in 2010 to recognize the leadership and dedication of the FIRST most outstanding FRC students. Students who earn the FIRST Dean’s List Award status, as either a Nominee, Finalist, or Winner are not only great examples of student leaders who have lead their teams and communities to increased awareness for FIRST and its mission all the while achieving personal technical expertise and accomplishment, but it is the intention of FIRST that they continue on, post-award, as great leaders of FIRST ever growing student alumni and as advocates of FIRST. FIRST Dean’s List Finalists will go on to compete at the 2014 FIRST Championship event towards then final selection of ten FIRST Dean’s List Award Winners. The Woodie Flowers Award celebrates effective communication in the art and science of engineering and design. The award recognizes an individual who has done an outstanding job of motivation through communication while also challenging the students to be clear and succinct in recognizing the value of communication. The 2014 Regional Woodie Flowers Finalist Award (WFFA) Winners will go on to the FIRST Championship Event and compete against prior WFFA Winners for the 2014 Championship Woodie Flowers Award. The team is currently preparing for the 2014 Queen City Regional in Cincinnati, Ohio this week. More information, award submissions, and pictures from our regional events will be posted soon!